Every smart individual realizes the importance of expert help at the right juncture. Behind every Edmund Hillary triumphantly waving a flag at the pinnacle is month of toil under the watchful eyes of a committed trainer. For the past 14 years, we at BT have been that trainer for many a successful students. So, do we have some magic formula that will open the gate of a favorite institute for you? No, we do not. There is no substitute for all the hard work that you alone must put in. What we do have is the knowledge, expertise and the right classroom culture. Our knowledge will tell you how to channelize your efforts and how to focus your attention so that you are able to achieve maximum in minimum time. Our expertise will take you through so many simulations that when you face the real test you will have confidence of being on familiar ground. Our classroom culture will help you stay positive and motivated throughout. Once again welcome to the BT family, welcome to success! Mr Vaibhav Bakliwal did his B.Tech in mechanical engineering from IIT Bombay after which he worked with Tata Motors for an year. But his penchant for teaching made him create, Bakliwal Tutorials (BT) in April 2005. BT began with the aim to help students preparing for IIT-JEE, realize their dreams; and to make sure that the preparation process itself becomes a fun filled and growth-involving experience. The institute is successfully doing so and is now training more than 2500 students at its various centers for various courses. Apart from his love for studies and students, he also loves music, solving puzzles and playing chess. 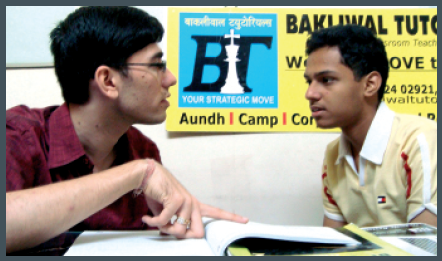 He has been Rajasthan Under-18 chess champion and has played in many national level championships. 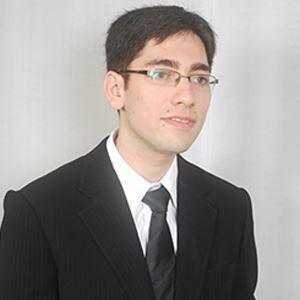 He was also class representative for his batch, general secretary for mechanical department and board games secretary for the institute at IIT Bombay. He has truly been an inspiration to thousands of students aspiring for the coveted IITs. BT Rocks In All Exams Of 2018! 'Genuine Results' : Power Of BT! Unlike most institutes which thrive on fake results, we believe in absolute transparency. All the ranks mentioned by us belong to the general category unless otherwise specified clearly. All the results correspond to our classroom students. 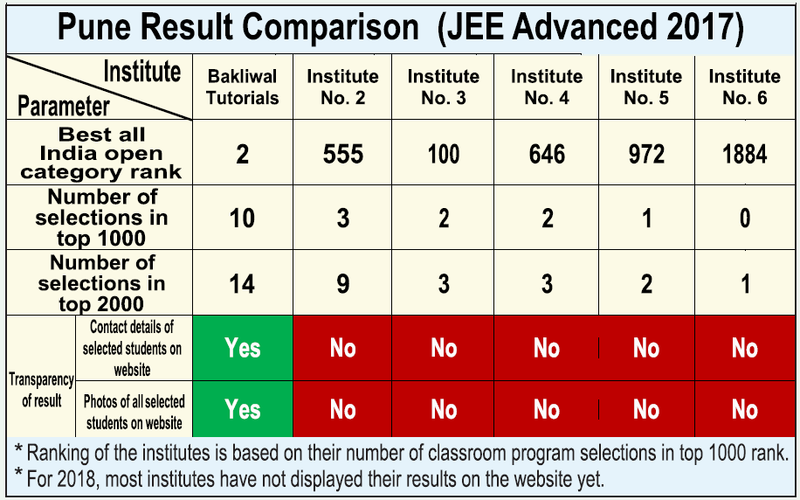 We have also given contact details of all our IIT - JEE/JEE Advanced qualified students till date, on our website, in the results section. We are yet to come across an institute in entire India which has the honesty, courage & confidence of declaring their results in such a transparent manner. Based on years of experience and expertise, the course material at BT is designed very systematically with detailed theory and best quality practice assignments. This material has been recently re-structured as per the current practices and demands for JEE preparation. Online & Offline B-tests at BT are thought provoking and bear close resemblance to the actual JEE paper. 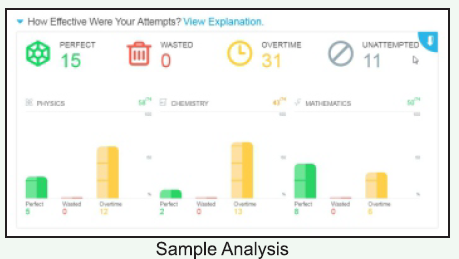 We analyze the tests from a student's perspective providing detailed and in-depth analytics on time management and test taking strategy. Comparison with Toppers: Students can compare themselves against toppers of each subject of test with respect to their marks, accuracy, rank, etc. Topic wise analysis: Students get to know about their performance in particular topics across all subjects giving them a clear understand of their strengths & weaknesses across topics. Analysis as per question type: Questions in each test is tagged as per various types (formula based, theoretical, memory based, calculation based) and students get to know how they fared under each type giving them an understanding of where they need to improve. We ensure that we stay connected with parents through various ways and keep them in loop with respect to their child's progress during the preparation. Parents are sent absenteeism SMS on daily basis, test results with detailed analysis is shared with them. We conduct a seminar on effective parenting where we share our views on how parents acn contribute in child's studies. PTM is occasionally conducted where one to one feedback is provided to them etc. Parents can also meet teachers occasionally after lecture. Thus, parents are kept totally involved during the entire journey so that together we can work for the intellectual growth of the child. At BT, we strongly believe that 'deliberate practice, and not just practice, makes one perfect'. With this intention, we provide an academic diary to our Comprehensive course students where they can continuously analyse the progress of their preparation and accordingly chart out improvement plans. 1) Weekly Study Planner: In this section, student needs to plan their studies on a weekly basis, jot down the subject wise topics which they plan to study in a particular week and keep a track of the same. Parents and teachers also monitor the same. 2) BTests analysis: In this section, student analyzes each and every test he takes at BT and jots down important learnings derived from the same. 3) Important BTest questions: In this section, after each test, student notes down the important questions from that test which should be revised during the time of revision. This helps the student to revise all the important concepts systematically during revision. 4) Confidence builder: In the last section, student tracks their preparation and confidence level subject wise and topic wise during revision. Student can accordingly devote more time to topics/subjects where confidence level is low. All in all, this academic diary if used sincerely can lead to immense self improvement during the 2 year preparation and make him/her a worthy and successful student. Along with the routine lectures, we also conduct regular doubt clearing / revision lectures to ensure that students get enough revision as the syllabus moves ahead. We also have at least two set of faculties per subject solely dedicated for clearing doubts of students of all batches. Students can spend time with them on one to one basis or in small group at their convenience to get their doubts solved. We at BT teach the basic concepts so well that the student understands the subject to the core and then it is just a matter of little bit of tuning according to the different exams. We ensure that the students get thoroughly prepared for the board exams & other popular exams like MHT-CET, BITSAT, KVPY, Olympiads etc as well. For additional help, we shall organize descriptive tests and have seminars on presentation skills and memorizing techniques and cover those few topics as well, which are not in JEE syllabus but are asked in Boards & other exams. Students at BT have been doing exceptionally well in board exams & other exams. 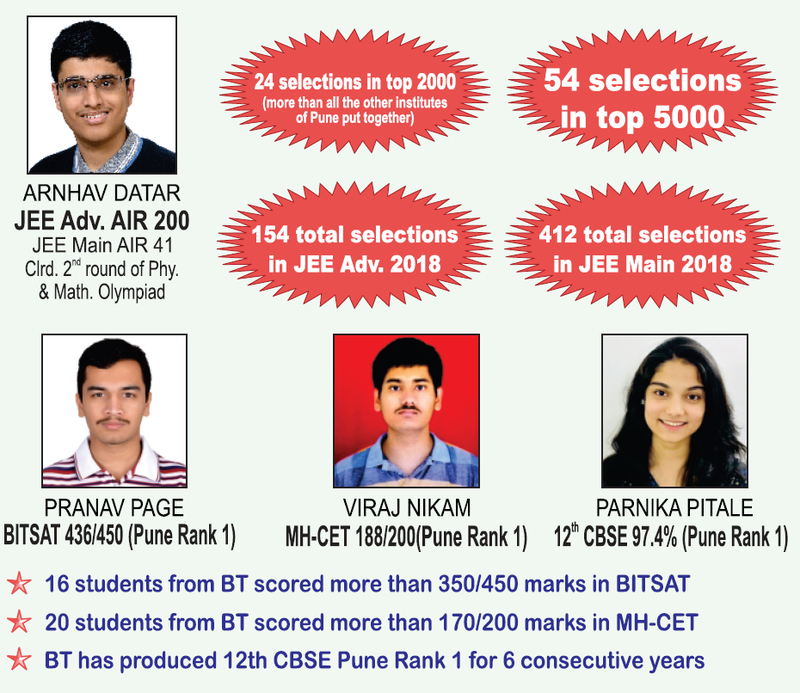 BT students have secured Pune rank 1 in 12th CBSE boards from the last 6 consecutive years now. In 2017, 2015 & 2013, our student topped not just Pune but entire Maharashtra in 12th CBSE board. In 2016 CBSE boards, not just Pune Rank 1 but Pune Rank 2 and Rank 3 are also BT students. In other exams as well, BT students have been doing consistently well (details of the same are given in a page ahead). Merit based batches is one of the attributes that is common across all the successful JEE institutes across the country . It is a proven fact that when students study with peers of relatively same intelligence level, they are able to learn more and even the teachers are able to plan their lectures well. This also creates a spirit of positive & healthy competition among the students. 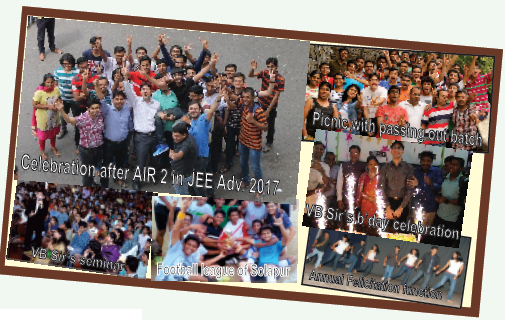 Out of the box events like Whizz-kid (puzzle competition), felicitation function, birthday celebrations, pledge day, picnics, seminars, counseling session after JEE result, etc truly make BT different. We create an official Whatsapp group for students batch wise where students post their doubts and other students and teachers of that batch solve the same. This helps students to get instant solution to their doubts almost any time through out the day. Official updates are also posted by BT team in that group. In addition to the classrooms, separate study rooms are maintained which are dedicated for students for their self studies. Students can sit in that room before/after the class or any other time to study alone or do some group studies. Students can also make use of the various reference books available in the library. In addition to the regular lectures, special seminars on various topics are conducted at regular intervals to guide the student on mental and other aspects which are important for JEE preparation along with the academics part. Special seminars/interaction sessions are also conducted with parents where we discuss with them as to what can be their role on their child's preparation. This ensures students are highly motivated and aware about all the important aspects during their JEE preparation journey. Collaboration with Central Government for their special scheme for SC/OBC students. Amidst hundreds of institutes across the country, we have been chosen by the Central Government (Department of Social Justice & Empowerment) for their special scheme for SC/OBC students. Under this scheme, the government will sponsor the complete fees along with some monthly stipend of deserving and meritorious students from SC/OBC background. This scheme is currently valid only for students of Compact course. This would ensure that deserving and needy students of reserved class are not left behind in getting quality coaching.